TIGG offers virgin coal based, wood based and coconut based granular activated carbon filter media which can be used for environmental remediation applications and removal of trace contaminants that occur in water and liquid streams. TIGG also provides reactivated coal based granular carbon filter media. These liquid phase activated carbon filter media have a high activity level in combination with a selection of transport and adsorption pores to accommodate adsorbates of varied molecular size. The higher adsorption energy pores that permit the removal, in many cases, of 100% of most organics from water and other liquid phase applications. Click on a product name to download the corresponding PDS. Types of activated carbon filter media, with various particle sizes, base materials, and activity, may be selected for pressure drop considerations and application parameters including type of contaminant and concentration. Traditionally, coal-based carbon filter media have been preferred as they provide excellent performance for contaminants and a broad range of concentrations. Coconut carbon filter media have generally performed well with low boiling point, low molecular weight compounds at lower concentrations. Wood based carbon media offer superior deodorization properties. The smaller mesh sizes are more suitable for units with lower flow rates or where it is desired to compress the active adsorption zone while the larger mesh sizes offer better pressure drop characteristics or better yields in a reactivation service cycle. Activity gives an indication of the capability of the particular adsorbate to provide surface loading. Higher values generally indicate a greater capability to provide surface loading. All virgin liquid phase activated carbon filter media are capable of producing non-detectable effluent quality for adsorbates which are cost-effectively adsorbed. Reactivated carbon filter media are available for application where lower capacity and less stringent effluent quality will permit better cost-efficiency. 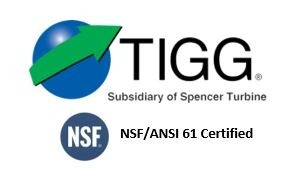 For more information about TIGG’s Liquid Phase Activated Carbon Filter Media, call 1-724-703-3020 or click here to contact us online.